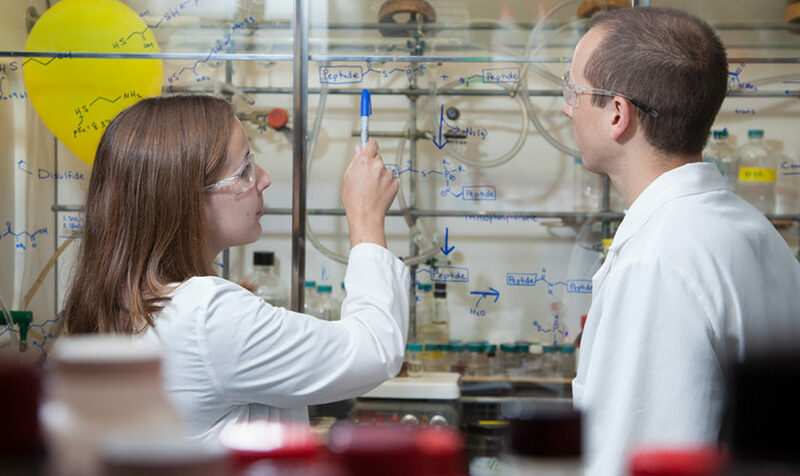 The Molecular and Cellular Pharmacology Graduate Program at the University of Wisconsin-Madison is ranked in the top Pharmacology programs nationwide, reflecting the outstanding teaching and research quality of its members. The program is based in the Basic Science Departments of the University of Wisconsin School of Medicine and Public Health. The objective of the Molecular and Cellular Pharmacology Training Program is to equip students with the skills required to conduct high impact biomolecular, biomedical, and pharmacological basic research. The program assists students in becoming independent investigators in these research areas. Advances in biomedical sciences are often based on the development of new drugs which improve and save the lives of millions of patients. Drugs with specific biochemical actions are also powerful research tools. They provide pharmacologists and other biomedical scientists unique research opportunities which help to elucidate cellular signaling cascades. Students of the program will develop expertise in the fundamentals of Molecular and Cellular Pharmacology. They will be able to solve a variety of problems in basic biomedical sciences involving the design of research strategies for the discovery of novel drugs or gene therapy approaches.